Spring is here – and not a moment too soon! 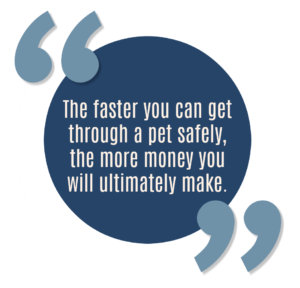 Many of us will be seeing a lot of pets that are ready for a great makeover in the coming weeks. As many of you know, I’m a big dog person. Working on these large furry dogs that have a huge shedding problem is one of my favorite things to do in a grooming salon. Over the years I’ve gotten really quick with the process and rarely cringe, no matter what the size of the dog, nor the condition. My #1 rule is: Never work on a dirty dog. If water can penetrate the coat, let your products do the job. Working on a dirty dog is not only unpleasant, but it also takes longer to do. There will be a lot of coat damage and breakage. A dirty coat is dry and brittle. The dirt and dander trapped within the fur makes it more difficult to brush out. Working on a clean coat will be easier for both you and the pet – and much more enjoyable. If there are large chunks that water cannot penetrate, go ahead and break up the tangle using the tool that is safe for the pet. Don’t worry about removing it completely, just break it apart so the water and shampoo can do their job. Prepare your bathing area. If the dog is exceptionally dirty, use a shampoo especially designed for dirty dogs. 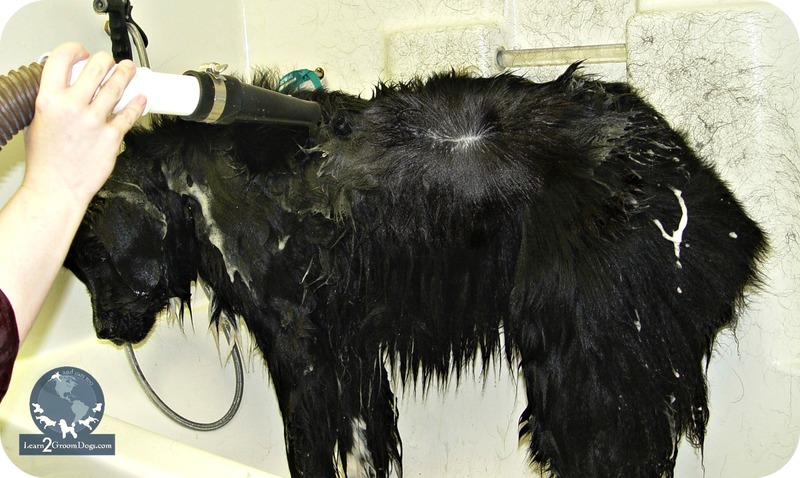 Using a follow-up treatment of a skin and coat conditioner after bathing twice (or maybe three times in some areas) will assist with the brush out and dead coat removal during the drying process. Make sure you have all the tools you’ll need to aid in getting the dog clean, like rubber curries or scrub brushes. Make sure you have plenty of towels handy! Once the pet is clean and thoroughly rinsed, apply a skin and coat conditioning treatment before heading to the drying table. Read your directions: some conditioning treatments need to be rinsed out while others do not. Your high velocity dryer and a heavy slicker brush will be your best friends during the drying process. First, blow out as much moisture and loose coat at possible with the air flow. Use the highest power setting the pet is comfortable with along with a condenser cone. Once you have pushed as much water and loose fur from the pet, remove the condenser cone and bring the air flow close to the pet’s skin. “Boost” any loose coat out of the dog by lightly patting the area with a slicker brush where the air is striking the skin. Continue to work over the dog in a methodical manner until your brush glides through the coat easily and no more loose coat is trapped in the brush. When the dog is complete, it should smell clean and fresh. The coat should be glossy and float freely as the dog moves. There should be an irresistible desire to reach down and bury your hands in a freshly groomed pet. What are your favorite tools and shampoos to use for those tough jobs? What secret tricks did we miss? Let’s talk about it on our Facebook page with your Melissa Verplank family.